For my giveaway post please scroll down!! Here is my layout this month using Berry71Bleu’s Tag. We were very lucky this month to have Studio 75 Sponsor our Design Team and sponsor our challenge. If you participate in our challenge you have a chance to win products from Studio 75. I was sent some beautiful papers and chipboard from Studio 75 and this is the layout I made. I used this beautiful picture of my kids holding Tinkerbell in their hand. She appears by magic after you take the picture. They always love this effect!!! I added that beautiful 2 Crafty chipboard Fairy. I covered it in black gesso and then I colored it with pan pastels. I used a Crafter’s Workshop leaf stencil to create the background. I spread fiber paste on the stencil and then inked it with different matching colored inks. I used lots of flower embellishments to create a fairy looking garden. I think I succeeded!! I really liked this girly themed bedroom. I was inspired by the colors especially the purple but mostly by the girly atmosphere; its almost magical!! 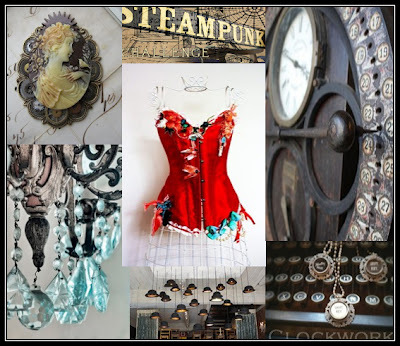 The Challenge for this month is STEAMPUNK! I wanted to do something different and use Marivic tag in another scenery. So your challenge for this month is to use any kind of steampunk element/embellishment on your craft project. To give you some ideas, i have put together an inspirational picture. Welcome to Mold Muse. We have been working with clay and resin since 1978 and making molds for over 20 years. Our experience brings you excellent quality molds using only high grade silicone rubber, not too soft, not too hard and perfect for highly detailed pieces and a long mold life. All molds are handmade by Ludi and her husband. We are very blessed this month because we have another Challenge Sponsor this month!! Studio75 is a Polish manufacturer of scrapbooking papers and other craft embellishments. Studio71 Prize: The entire summer&latte collection. The colors of this collection are beautiful, soft yellow, green, blue. 1. You are allowed to make a an altered/off the page project as long as you follow the challenge specifications. 2. Projects must be linked up to our linky tool in the sidebar, using the URL of the ACTUAL POST not your entire blog. 3. You may submit as many entries as you want and combine your entry with up to 2 other challenges. 4. It is required that you mention in your blog post that you are playing along at Berry71Bleu TOGETHER with a link back to our blog. 5. All entries must be received by MIDNIGHT EST on the 31st day of the month the challenge was posted. 6. Entries to be submitted via the linky tool at the top of the sidebar ONLY, not by e mail and not by linking up in the comments section please. Last but not least and since I was the one to post today out of all days. I want to make a small prayer here for those who perished in 9/11. May they rest in peace!! Parabéns pelo LO!!! Ficou belíssimo!!! This is very pretty, Keren!! Keren, you attention to detail is amazing. I love the whole layout and especially the little fairy. LOVE the photo, the kids look awe struck. Beautiful work. Seus projetos são muito inspiradores!! wowww these are just my favorite colors you've really made a magical layout. all those beautiful flowers stunning page. Wow Keren! I l-o-v-e this LO. In my opinion is one the best! Extremely gorgeous bunch of flowers. I just love so much the photo. What a gorgeous layout! I love that fiber paste! Where do you get it? What a great challenge…I have never really tried anything steampunk. Maybe I'll have to give that a try!!! So creative, the background looks amazing with the texture, exquisite! Wowwwwwwwwwww!!!! I love love love that photo, the flowers and loving the fairy card!!!!! Love your fairy page…MAGIC indeed! Stunning Keren! Love the gorgeous flower sprays! Wow Keren this is totally stunning! Great job!! Absolutely stunning layout, Keren!!! Thank you so much for playing along with us at Get Creative! Keren, your pages are always a delight to view! Love love love the clever idea to make tinkerbell appear, the clusters and the torn papers at the back! Keren your layout is definitely magical!!!!!!! absolutely love it! Thank you so much for playing along with us at Get Creative! !